All of the Christmas decorations are down, now what? Our homes feel so bare after having the twinkling lights, trees filled with ornaments, and precious keepsakes taken down. It’s no secret that I LOVE to decorate my home, but I especially love to decorate for the holidays and seasons. I think perhaps part of that is because I love my home to feel fresh and newly decorated. I easily get tired of the same old decorations. However, at the same time, after moving boxes and boxes of decorations around to organize them, it also gets overwhelming to have so much “stuff.” So this year, one of my goals is to create a home we love – one room at a time. I’ve decided to simplify the decorations, working to keep only the items out that I really love, and then adding in a few pieces to update the space for the holiday or season. I’ve always loved antiques and vintage items, but felt like they needed just a bit of an update. So the “new” Farmhouse Decor that has taken the world by storm thanks to the Chip and Joanna Gaines from Fixer Upper, fits in perfectly with how I want our home to look and feel. 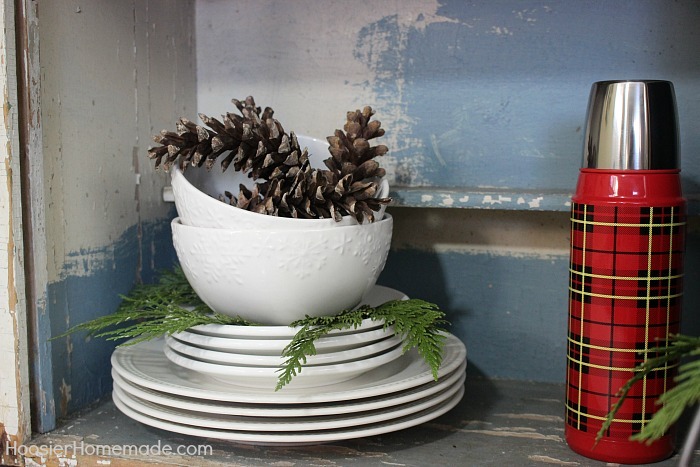 I started the Farmhouse Winter Decor in the Dining Room. This room still needs to have a fresh coat of paint, a new table and some new wall hangings, but overall I love how it turned out. It’s simple, yet cozy. 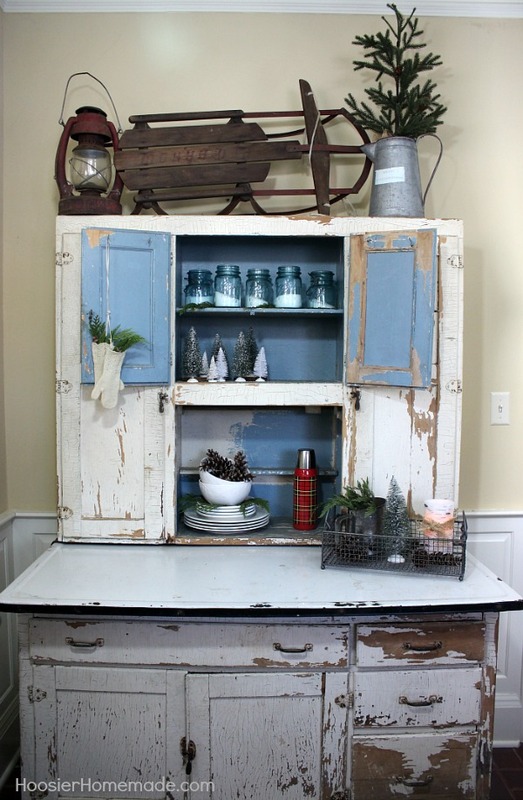 The Hoosier Cabinet was the first spot I tackled for the Farmhouse Winter Decorating. Now, I have to be honest, it took me 3 tries to get it how I really wanted it. (which is why this post is up so late after Christmas) I had a picture in my head of how I wanted it to look, and for one reason or another, it took me awhile to create it. But I absolutely love it now. One of the top, I left the antique wooden sled that I had up during Christmas, then added one of my antique lanterns for a little color and texture and an artificial tree that I put inside a galvanized pitcher. One the center shelves, I added aqua mason jars filled with Epsom Salt, bottle brush trees that I left out after Christmas and some fresh green that we had in the She Shed for Christmas. The trees are gathered together to one side of the shelf, just for something a little different. On the bottom shelf, I left the stack of white plates, and added a couple white bowls that I found after Christmas on sale at Walmart. I think they are from the Pioneer Woman line. Then added a few pine cones and fresh greens. The fun little vintage looking thermos is from Walmart too. I love the pop of color it adds and it reminds me of my Dad. 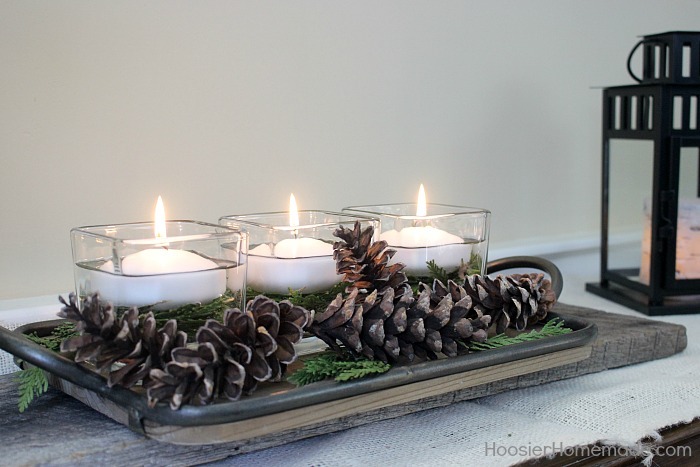 Then off to the side, I filled a wire basket with a candle, antique flour sifter, bottle brush tree and a handful of pine cones. The candle is from Hobby Lobby and is battery operated which I love because I always forget to blow out candles. And then I tied a piece of burlap around the candle for added texture. Fresh greens in the sifter bring in a bit of the outdoors in and ties into the greens I added around the white bowls. 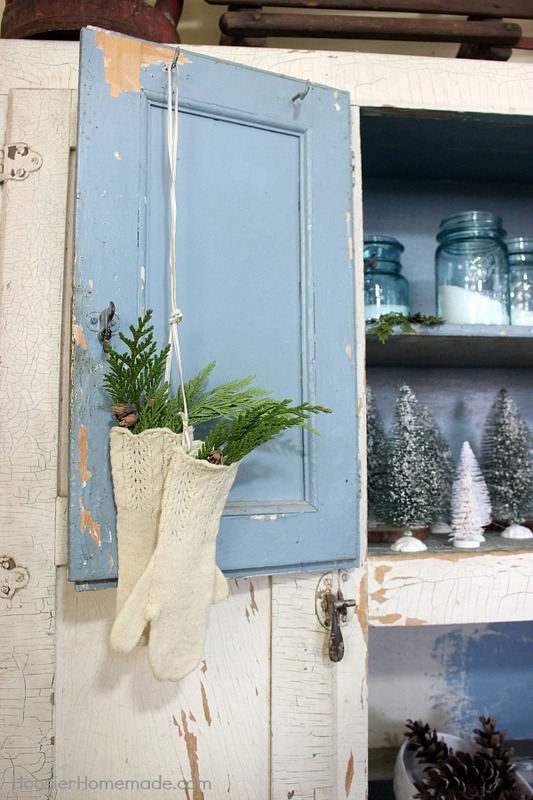 A pair of white mittens that I have had for many years (found at Goodwill) are hung and filled with fresh greens. 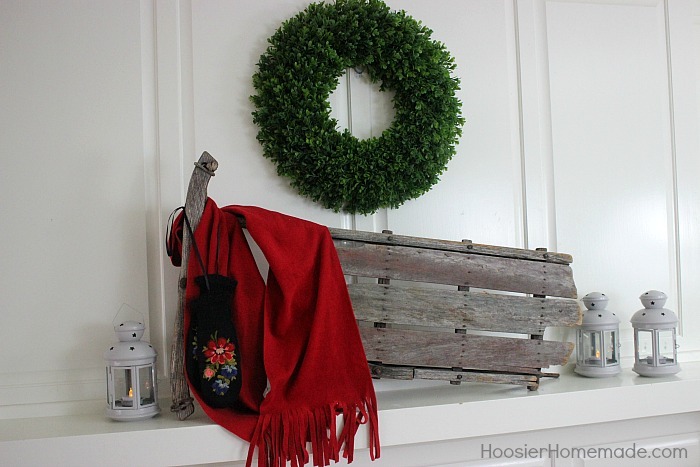 You will notice a theme throughout the Farmhouse Winter Decor – white with some fresh greens. I tried to stick with that theme throughout all of the winter decorations, and adding a little pop of color here and there. On the wall under the window is the credenza. Once again, I stayed with the white theme, keeping the dishes out that I had displayed in there. 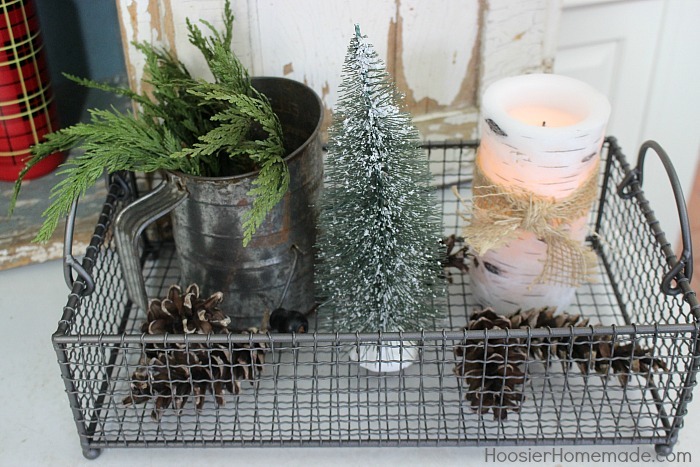 The galvanized watering can is one of my favorites, so I brought it inside and used the greens and sticks from the She Shed Christmas planters. 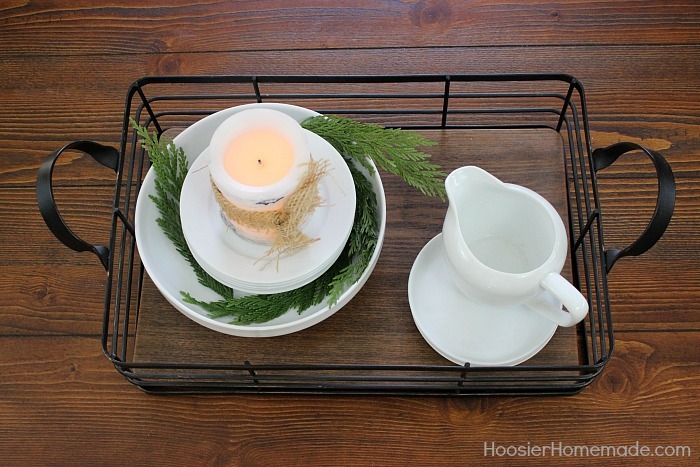 Cutting boards, wood chargers that I first used in our Holiday Entertaining Hacks, and an aqua mason jar on the shelf and in the basket to connect the theme from the Hoosier cabinet. 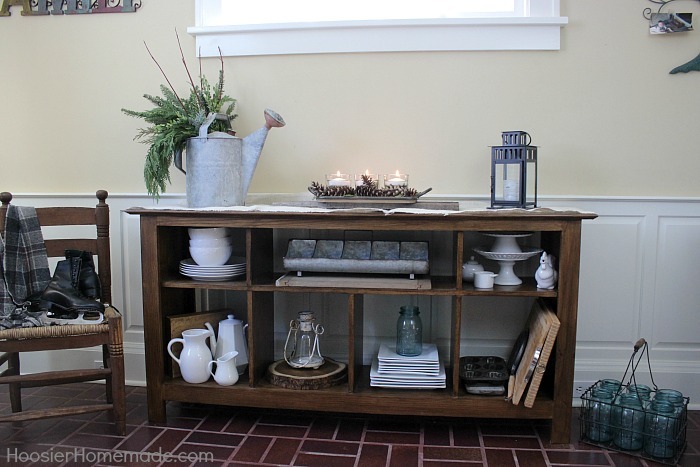 On top of the credenza, I added a piece of white burlap for color as well as texture. For the centerpiece, I first added a piece of wood, then placed a wood tray on top. On the tray, I placed 3 square glass containers, filled them with fresh green and water, then added a floating candle. 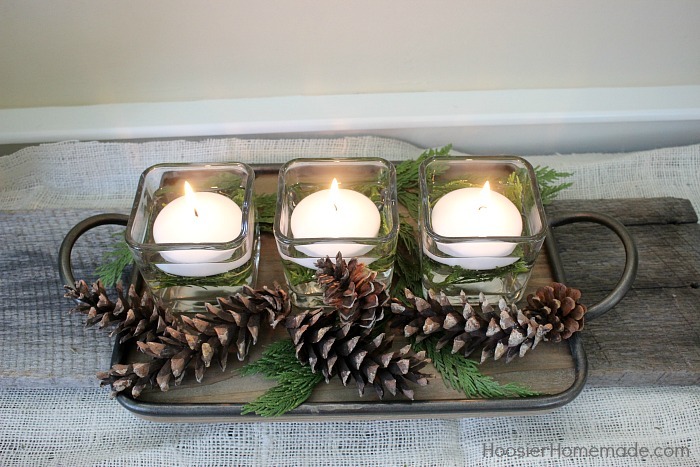 Around the containers, I added more fresh green and pine cones. 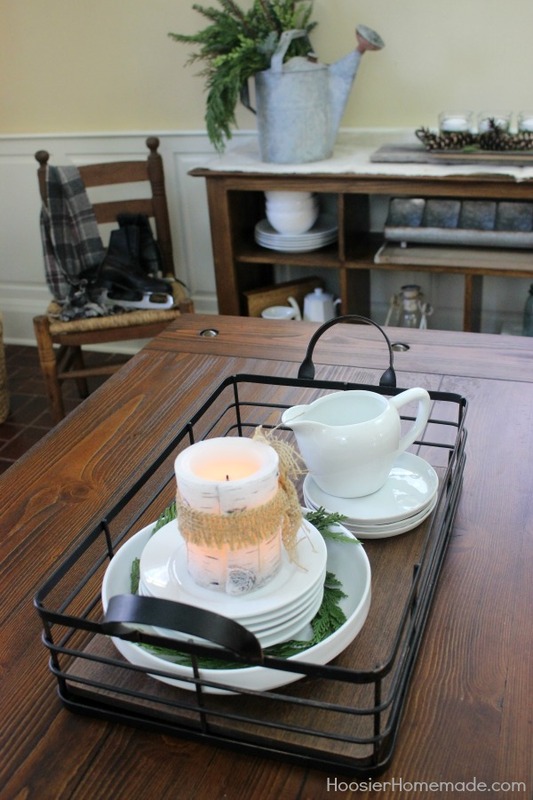 To finish up the Dining Room winter decorations, I added a wire tray and filled it with more white dishes, fresh greens and a shorter candle with another piece of burlap tied around it. I have used this wire basket more times than I can count. I love finding a piece that is so versatile. The wire tray was first filled with gourds, Indian corn and fall leaves. Then I used it to display succulent plants both in the easy Farmhouse Shelf Decor and then in the Farmhouse She Shed Reveal. Moving onto the Living Room, this shelf has been a few places, first in the Dining Room, then in the She Shed and now the Living Room. I think it’s finally found it’s forever home, I love it in this corner. We have struggled for as long as we have lived in our home (9 years) to arrange the furniture in the Living Room. It’s a long narrow room and while I love the Mantel area, it’s pretty massive. I’ve talked about how big it is before. There are also 2 doors, one that leads to my office (which is not a problem) but the other large door opening is not centered, so we really can’t put the sofa near the fireplace or it sticks out really far into the room. Well, anyway, hopefully we have figure out a good arrangement now. 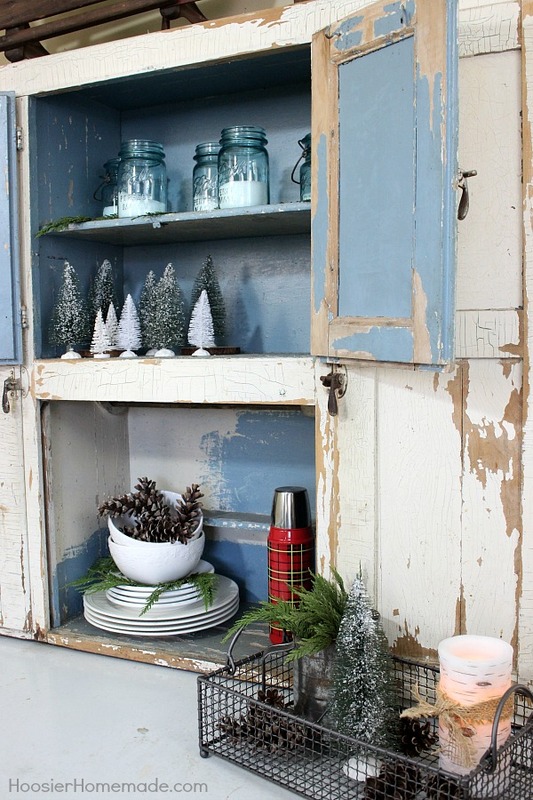 And I love how the Farmhouse Winter Decor looks on this shelf. On top I added a lantern, a white metal container with an artificial tree inside and a pair of white skates. I love how the skates add brightness to the shelf, and are vintage as well. 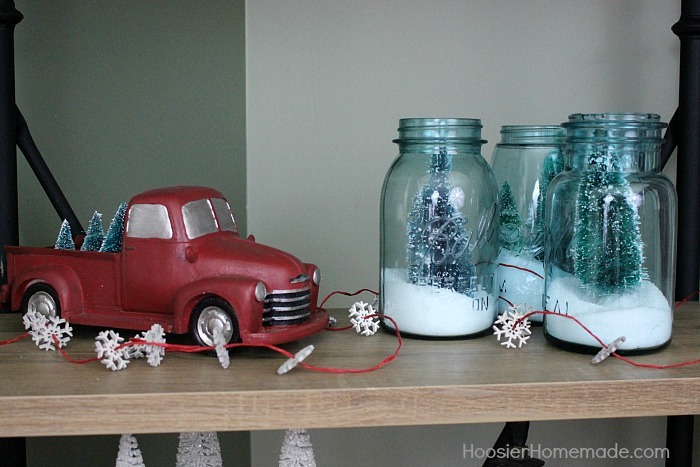 The red truck that was in the She Shed for Christmas time, looks so fun on the shelf. 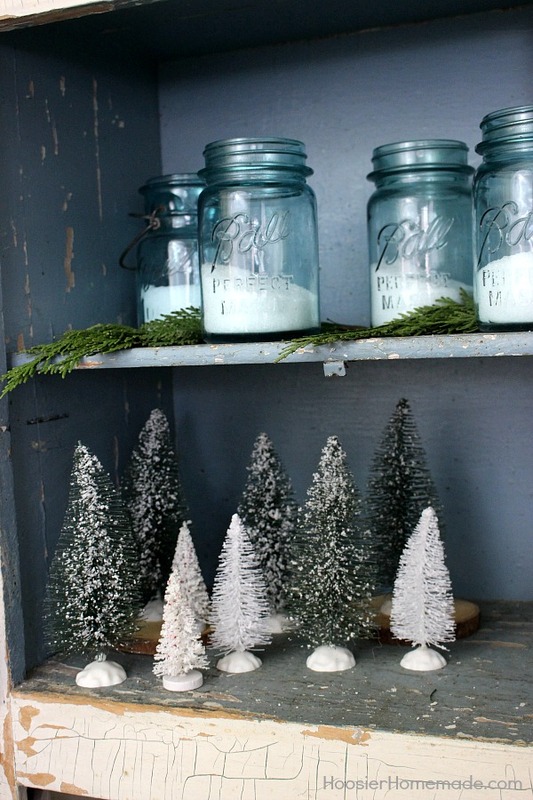 The tall aqua mason jars are filled with Epsom Salt and bottle brush trees, and a wooden snowflake garland that I had in my stash fills the shelf. 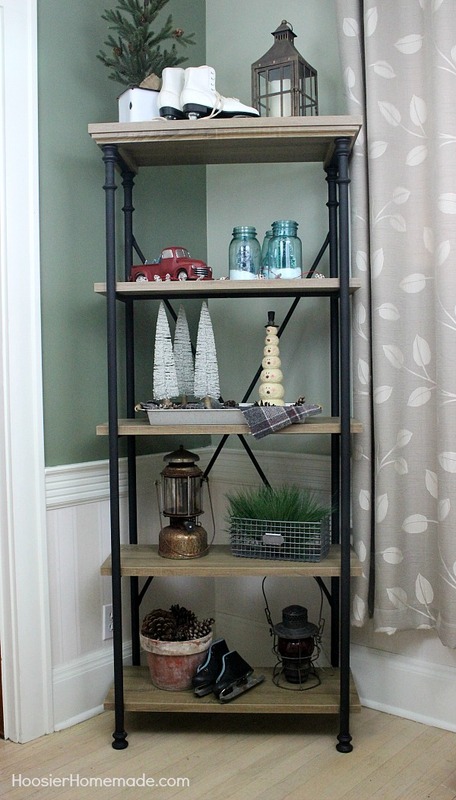 On the next shelf, I added a galvanized tray and softened it a bit with a piece of gray flannel. 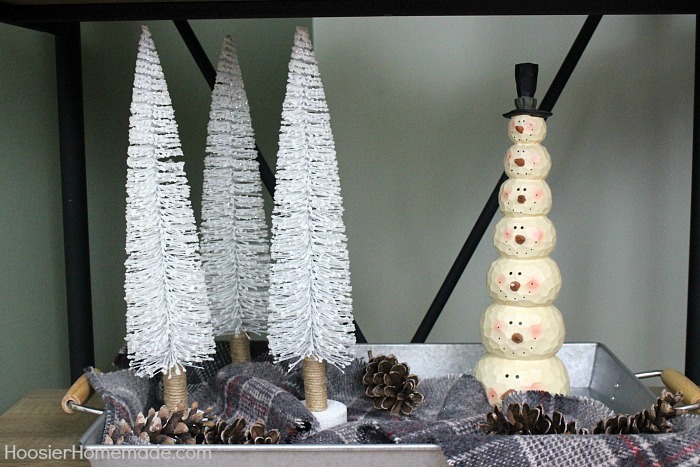 Then added white bottle brush trees, a snowman decoration and a handful of pine cones. 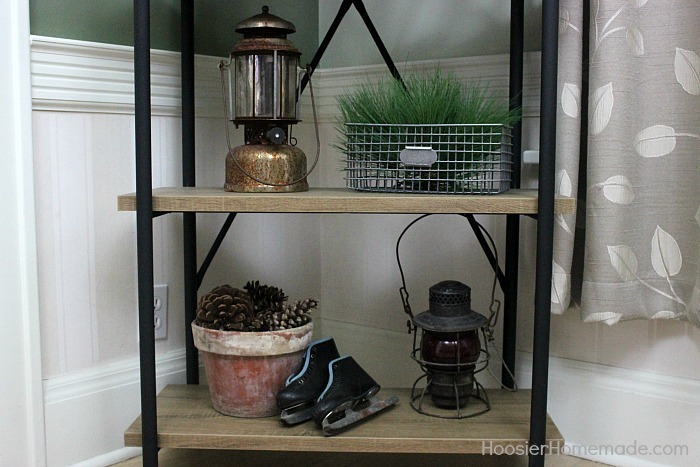 Finish off the Farmhouse Winter Decor are a couple antique lanterns, a wire basket filled with artificial greens, an old clay pot filled with pine cones and antique children’s skates. Like I mentioned earlier, my goal is to keep everything very simple this year. 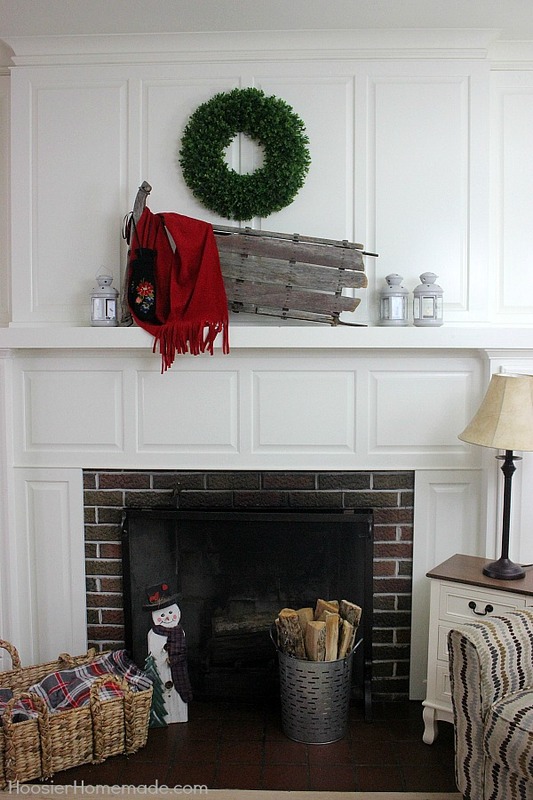 On the mantel, I added an artificial boxwood wreath that I can leave up all year, then added a wooden sled, draped with a red scarf and a pair of vintage mittens. A few white lanterns that I found at IKEA on sale after Christmas. In front of the fireplace, a large basket filled with soft blankets, a galvanized olive bucket filled with wood (it was in the She Shed too) and a wooden snowman that my Dad made many years ago. Do you decorate after the holidays? 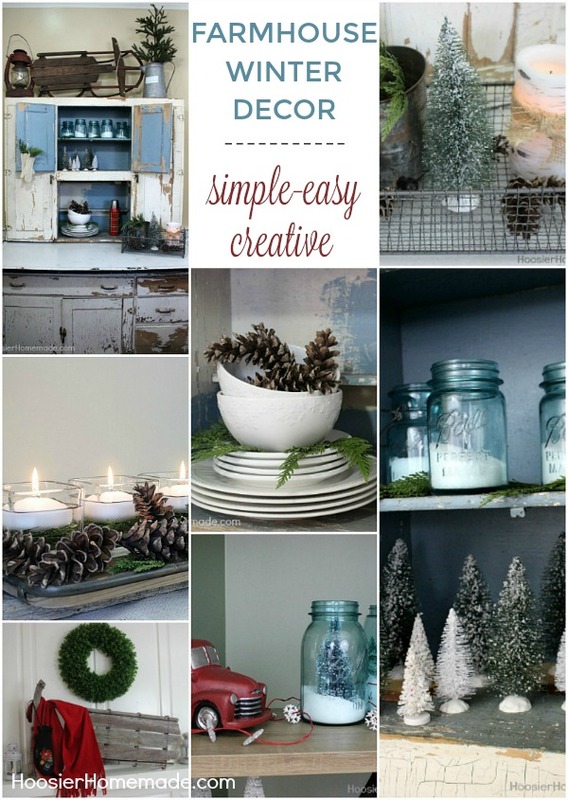 What winter decor do you love?